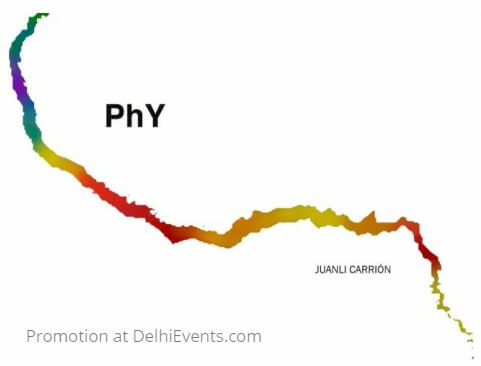 About the exhibition: PhY Carrión proposes a trip along the Yamuna river where he will use textile dyes of food origin to visualize the current water contamination in the Yamuna river. The fact that the Yamuna River flows through several industrial cities, that costs a Price to the river. Industrial dumping (chromium, arsenic, cadmium), a poor sewage system, overpopulation, saturated landfills, insecticides, pesticides, cattle washing and many other issues have positioned the sacred Yamuna River into one of the world´s most polluted rivers Taking this, Carrión proposes a multidisciplinary artwork that will combine artistic action, installation, video and a mural painting taking natural inks, local food and the pollution of the Yamuna river as the basis of his work. To do so, he will use the locally cultivated Madder Root (Rubia cordifolia) -and potentially other organic materials such Red Cabbage- to create ph sensitive dyes that will impregnate pieces of natural packed wool felt, which will then be washed in the river at 10 different stops along the Yamuna, 1,376 kilometers of route. As the Madder root colorants vary in color depending on the acidity of the water with which they are dyed or rinsed, the resulting textiles will reveal the different levels of contamination in the water in a variety of colors ranging from red to yellow and blue. The resulting pieces of cloth will be used to create an installation in which the trajectory of the Yamuna River is reproduced, turning its dark mythology into a colorful spectrum that makes its contamination visible. PhY uses an ancient process to reveal the drastic damage modern unsustainable production systems have caused in our ecosystem. As theorist Ashley Dawson points out “ So many of the cases we are facing are symptoms of the same underlying sickness: a dominance-based logic that treats so many people, and the earth itself, as disposable” In addition to the installation, Carrión will offer a workshop in line with what he calls Culinialismos a series of participatory sculptures, incorporating the recipe as a type of choreographic instruction and a record of historical and cultural importance. in New York. In 2017, Carrión founded OSS Project, Inc, a Non-Profit organization born from his series of public art interventions in the form of geopolitical gardens under the name of Outer Seed Shadow, which visualized conflicts in neglected social ecosystems since 2014. OSS gardens have been commissioned by NYC Parks, NYCHA, La Nau, La Conservera Contemporary Art Center or Kulturföreningen Triennal among others. In 2018 OSS commissioned two New York base artists to develop two new gardens in the Bronx and Manhattan.